Maize defeated Ark Valley Chisholm Trail League rival Newton 45-0, in Week 4. The Railers had the ball for nearly 28 minutes, nine-plus more than Maize. The turnover margin was even, and Maize outgained Newton by just 59 yards. “The Maize game was really disappointing for our kids, because we felt like underperformed,” Newton coach Chris Jaax said. However, Jaax and his coaching staff used the performance as a teaching moment for his squad. Maize, led by their great team chemistry and speed, continually kept Newton from big plays. Multiple times, Jaax watched a play on the sideline and thought, at the snap, Newton would gain 15, 20 yards. Instead, Maize showed great effort, especially on the backside, and limited Newton to a much smaller gain. Then, the Eagles created a negative play and put Newton’s offense in a difficult third down situation. All contest, Newton stalled on key downs with a collective 6 of 22 (27 percent) on third and fourth down. When Maize needed to punt, standout quarterback Caleb Grill averaged 44.5 yards on a pair of kicks. Jaax showed his Railers the high energy that Maize’s defense produced. Jaax, in his third year as Newton’s head coach, is a former Bishop Carroll assistant and watched some of the state’s best large-school defenses in recent years. He compared Maize’s defensive effort and multiple fronts to past Carroll’s squads. Maize’s collective effort has led to a 5-0 start and the state’s best scoring defense for all classes. “What these guys have done so far has been pretty amazing,” Maize coach Gary Guzman said. The Eagles, ranked No. 3 in Class 5A, opened the season with four consecutive shutouts before a 27-2 victory against Goddard last Friday. This week, Maize is at 0-5 Salina South. Goddard’s points came on a Maize attempted screen pass when the Lions tackled the Eagle running back in the end zone for a safety. Late in the contest, Goddard was deep inside Maize territory, but the Eagles recovered a fumble and kept the previously undefeated Lions from scoring. Last season, Maize finished 9-2 and allowed 17.7 points per game, third-best in 5A. The Eagles took significant graduation losses, especially linebacker P.J. Smith, the Ark Valley Chisholm Trail League’s defensive MVP. Maize’s 4-2-5 doesn’t have significant size, but its speed at all levels has helped the defense improve. Guzman, in his eighth season at Maize and 27th overall as a head coach, has not mentioned the shutout streak to his players. Defensive coordinator J.J. Milanovich, a Maize graduate, leads the unit and coaches the linebackers. Guzman said Milanovich has served on the Eagles’ staff all but one year of his tenure. James Hammett coaches the defensive line, and Rocky Helm, well-known as Maize’s successful baseball coach, leads the defensive backs. Guzman has been pleased with several fundamental areas. Last season, Maize allowed 307 yards a game with 6.2 yards per pass attempt and 4.2 yards per rush. Opponents converted 39 percent of third downs. The Eagles forced 1.8 turnovers a game and finished plus-10 in turnover margin. This fall, Maize has allowed 180 yards a game. The big change has come in pass defense and third down. The Eagles have limited teams to 3.3 yards per pass attempt and 3.2 yards per rush. Opponents are 17 of 75 (23 percent) on third down. “I definitely think that we have a little bit of a clutch factor,” Stanton said. Maize has forced 2.4 turnovers a game and plus-7 in turnover margin, though is even in the last three contests. “Plays didn’t go for what we thought they would, because kids would hustle from the back side, and they would make a play,” Jaax said. Grill, well-known for his basketball talent and commitment to Division I South Dakota State, has played well at quarterback and punter. Last year, Maize had one contest where it averaged more than 40 yards a punt. This season, Grill has already done that three times, including six punts for an average of 42 yards in a 21-0 win versus Haysville Campus in Week 3. The Colts have averaged 29 points a game it its other four contests. Senior Tanner Ohnmeis, a returning starter, is at safety, along with senior Adrian Triana. Senior Cameron Grimes and junior Andrew Hanlin start at cornerback. Senior Carson Shively is at linebacker, with sophomore Kendall Norrod. Grimes and Stanton are the defense’s most experienced players as both started as sophomores. “My biggest improvements have been confidence and consistencies with my mental game, and I think just learning how to put physical attributes with my mental attributes,” Stanton said. The four defensive linemen are senior Brett Jesseph, sophomore nose guard Kyle Haas, Stanton and junior Keaton Robertson. Last year, Haas, as a freshman, was a starter, along with Ohnmeis and Shively. Haas, a great wrestler, is 5-11, 190 pounds. He showed the ability last year to wreak havoc in the backfield and move sideline to sideline. “He knows to compete, and he has the ability to create double teams and also to get loose and create some issues for the quarterbacks,” Guzman said. The offense features junior running back Caden Cox and junior wide receiver Preven Christon, who is key in the return game. Senior Jose Ledesma has been a hybrid player on defense at linebacker/defensive back. Junior Carson Wheeler is a key linebacker reserve. Stanton noted Ledesma and Jesseph as two players having excellent seasons. Basehor-Linwood (4-1) will travel to De Soto (5-0) on Friday night in a game that will likely decide the champion of the United Kansas Conference in its inaugural season. De Soto sits atop the UKC standings with a 3-0 record, while Basehor-Linwood is 3-1 in conference play with a 14-13 loss at Lansing lingering as the only blemish on the Bobcats’ record. De Soto cracked into the Class 5A rankings at No. 5 this week, and are one of four remaining unbeaten teams in the classification. The success of Brian King’s team this season is remarkable given all the change the Wildcats have endured. De Soto finished the 2017 season 10-2 and ranked second in Class 4A, Division I. The Wildcats won a second consecutive Frontier League title and reached the state semifinals before falling to Bishop Miege – the eventual state champion and team that handed De Soto both of its losses. Fast forward to the 2018 season and De Soto has departed from the Frontier League for the newly-formed UKC and enrollment growth has the Wildcats reclassified in Class 5A. What’s more is the Wildcats graduated 18 starters off of the 2017 team. Yet after five weeks, De Soto finds itself undefeated and once again state-ranked albeit in a higher classification than a season ago. De Soto’s unbeaten season to date has partially been the result of a stingy defense that is allowing only 6.8 points per contest. The defensive success is remarkable given the Wildcats returned only one starter, junior defensive back Dallas Williams, from last year’s team. Williams has been exceptional, however, having intercepted five passes so far this season while averaging 25 yards per interception return. The Wildcat offense also entered the season as an unknown, returning only four starters from a unit that averaged 38 points per game. The experience that did return for De Soto was upfront where, senior linemen Victor Berumen, Devin Haynes, and Michael Mashburn each earned some level of all league recognition a season ago. The emergence of sophomore quarterback Jackson Miller has been key. Miller has been steady in completing 68 percent of his passes for 509 yards and eight touchdowns without an interception. Miller is also the team’s leading rusher with nearly 350 yards and eight rushing scores. Senior fullback Connor Brady, the Wildcat’s other returning starter from a season ago, has contributed 339 rushing yards and three touchdowns in four games. Basehor-Linwood has been equally difficult on defense in surrendering only 7.8 points per game. The Bobcats have been explosive on offense as well, averaging more than 50 points per game outside of their penalty-riddled one-point loss to Lansing. Senior quarterback Dylan Mussett has led a balanced offence that averages 177 passing yards and 178 rushing yards per game. Mussett has passed for 834 yards and 11 touchdowns. The Bobcats have three receivers with at least 14 catches and all three have at least 211 receiving yards. Senior Marlon McDaniel has rushed for 329 yards and four scores, while Nolan Ford has 268 rushing yards and 224 receiving yards. De Soto is the final UKC member left on Basehor-Linwood’s schedule, while the Wildcats still have a game against Shawnee Heights next week. Basehor-Linwood defeated Shawnee Heights 50-0 in Week 4 to deliver coach Rod Stallbaumer’s 100th career victory. One of the prevailing themes of the 2018 football season has been the high number of teams that have ended long losing streaks, including double-digit skids for Southeast-Cherokee, Kinsley, Wichita North, Fairfield, Flinthills, and St. John’s Military Academy. Quinter now has a 33-game losing streak, easily the current longest skid in Kansas eight-man football. 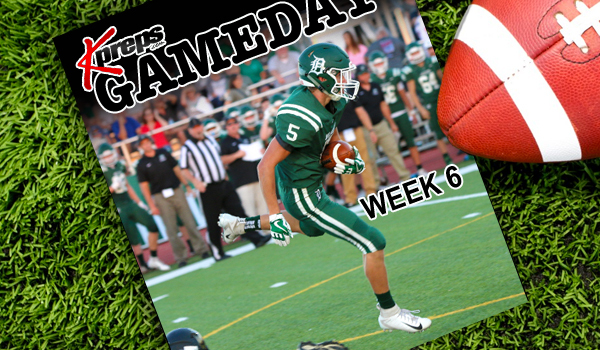 The Bulldogs’ last victory was a 54-34 home win against Logan-Palco in Week 6 of the 2014 season. This Friday, Quinter (0-5, 0-2) has an opportunity to break its skid against its longtime rival Wheatland-Grinnell (1-4, 0-2). The Thunderhawks opened the year with a 46-0 win versus Fairfield before four straight losses. Quinter had a narrow 50-44 road loss to Atwood-Rawlins County in Week 2, and fell 36-28 to Triplains-Brewster in overtime in Week 4. Quinter and Wheatland-Grinnell, both located in Gove County, are less than 15 miles apart down I-70. Quinter has transitioned down to Eight-Man, Division II, while Wheatland-Grinnell has transitioned back to Eight-Man, Division II from Six-Man football. Both squads are in District 6. The teams match up this week for Quinter’s Homecoming. This marks the first matchup between the teams since ’11 and just the fifth since ’04. Quinter won four straight meetings from ’08 to ’11. Bitter rivals Manhattan and Junction City will once again decide the keeper of the Silver Trophy when they meet on Friday in Junction City. The Indians, ranked No. 3 in Class 6A, are unbeaten and can virtually sew up the Centennial League title with a win over the Blue Jays. Manhattan has won at least a share of the league title in eight of the past nine years, and close out the regular season with games against Topeka West (1-4) and Highland Park (0-5). Since a controversial 21-20 overtime over Topeka High in Week 2, the Indians have posted impressive wins over Topeka Seaman, Washburn Rural, and Emporia by an average margin of 35 points. The Indians are led by senior running back Kevontae McDonald who has rushed for 816 yards and 14 touchdowns in five games. Last year, Manhattan routed Junction City 42-12; scoring a pair of touchdowns late in the first half to turn a 21-12 lead into a 35-12 halftime margin. The Indians have won six of the past ten meetings between the two rivals who traditionally get hooked up in close games. Last year’s rare blowout snapped a string of eight consecutive meetings that had been decided by nine points or less. While Manhattan can virtually wrap up the Centennial League title with a win over Junction City, second place in the league standings will be on the line as Washburn Rural takes on Topeka High at Hummer Park. Both the Junior Blues and Trojans enter the contest with identical 4-1 records, with both having lost to Manhattan. Topeka High dropped a controversial 21-20, overtime decision to Manhattan where it appeared Trojan running back Ky Thomas dived into the end zone for what would have been the winning two-point conversion. Meanwhile, Washburn Rural struggled offensively in a 44-7 loss to Manhattan in Week 4. Mill Valley will attempt to halt a three-game losing streak when the Jaguars travel to Pittsburg to take on Class 4A’s third-ranked Purple Dragons. Mill Valley’s record (2-3) is more indicative of their brutal Eastern Kansas League schedule that it is the Jaguar’s talent. The Jaguars fell out of the Class 5A rankings for the first time this season after last week’s 41-16 loss to Blue Valley North. For comparison purposes, Pittsburg defeated Blue Valley North 34-31 in Week 3. However, Blue Valley North all-state quarterback Graham Mertz played less than a quarter against Pittsburg before being injured. Metz returned last week against Mill Valley and passed for 225 yards and four touchdowns. Mill Valley also got a key player back from injury last week. Senior running back Cameron Young returned from injury to rush for 139 yards and a touchdown. Pittsburg returns home after a long trip to western Kansas that resulted in a 41-6 victory over Ulysses last Saturday. These two teams haven’t met since the 2015 playoffs when Mill Valley won 56-21 en route to claiming the Class 5A state title two weeks later. Pittsburg won a 2014 first-round playoff meeting, 42-21. Caney Valley at Frontenac – Another key game in a balanced Class 3A, District 1. Caney Valley looks to rebound from last week’s loss to district-favorite Galena, while Frontenac pulled off a late score to top Parsons 7-6. The Raiders’ district schedule has been front-heavy with Galena, Parsons, and Caney to open district play. Holton at Sabetha – These Big 7 Conference rivals sit atop the standings in Class 3A, District 4. Holton has won three straight games since an 0-2 start. While the Wildcats have won their first two district games, those wins have come against Hiawatha and Royal Valley which sit at the bottom of the standings. Meanwhile, Sabetha has won 12 straight games. Jefferson West at Perry-Lecompton – Jefferson West will try and stay in touch with the top half of Class 3A, District 3 when they travel to Perry-Lecompton. The Tigers dropped their first game of the season last week, 30-7 to Topeka Hayden. Meanwhile, Perry-Lecompton grinded out a 28-6 win over Santa Fe Trail. Santa Fe Trail at Wellsville – Staying in 3A, District 3, Santa Fe Trail travels to Wellsville in a crucial game for the Chargers playoff chances. Santa Fe Trail has dropped its first two district games, and will likely need to defeat Wellsville and/or Jefferson West to secure one of the district’s four playoff spots. Wellsville is essentially in the same boat. The Eagles have beaten Bishop Ward, but still have Jefferson West and Topeka Hayden on their schedule after this week. Prairie View at Girard – Burlington, Girard, and Prairie View are the top three teams in Class 3A, District 2. After a loss to Burlington in Week 4, Girard needs a win at home against the Buffaloes in order to keep its hopes of a district championship alive. Prairie View can essentially secure the district title with a win as the Buffs’ resume already includes a 28-0 win over Burlington. Wichita Collegiate at Andale – Collegiate will take on top-ranked Andale in a rivalry matchup that will likely end up deciding the Class 3A, District 6 championship. Clearwater currently sits atop the standings with Collegiate and Andale at 2-0. Collegiate’s lone loss came 32-0 to Wellington in the season-opener, while Andale defeated Wellington 28-0 a week later. Belle Plaine at Fredonia – The Dragons and Yellow Jackets are a couple of teams used to being in close games. Belle Plaine opened the season with a one-point, overtime loss to Inman, then survived a two-overtime game with a victory over Neodesha last week. The Dragons also scored late to beat Cherryvale, 41-40 in Week 5. Meanwhile, Fredonia has posted consecutive district wins by the identical score of 7-0. The Dragons and Yellow Jackets are tied atop the district standings with Douglass. Garden Plain at Chaparral – The most loaded district in Class 2A is District 6. Chaparral and Conway Springs sit atop the standings at 2-0, while Garden Plain and Hutchinson Trinity are 1-1. Trinity defeated Garden Plain last week to hand the Owls their first loss of the season. Garden Plain will try and keep pace with the pack with a road trip to Chaparral. The Roadrunners come in averaging 50 points per game, but have contests against the top three teams in the district in the next three weeks. Mission Valley at Southeast of Saline – Mission Valley will travel to Gypsum to take on Southeast of Saline in a key game for both teams in a crowded District 4. Riley County is the only unbeaten team in district play, while Rossville and St. Marys join the Vikings and Trojans at 1-1. The winner of this game certainly will gain the upper hand at claiming one of the playoffs spots, but will still have plenty of work to do. Little River at Macksville – The winner of this one likely claims the runner-up spot in District 5. Macksville sits at 2-0 in the district, although the Mustangs still have Central Plains on the schedule. Little River will present its own challenge. The Redskins (4-1) rebounded from a shutout loss to Central Plains with a 50-0 blanking of Pratt-Skyline. Graham Stephens (388 yards, 9 TD) and Hunter Thomas (335 yards, 9 TD) pace the Little River ground attack. Ness City at Spearville – Three teams stand out in 8M-I, District 6. Second-ranked Hodgeman County, Ness City, and Spearville are all 2-0 in district play. With Hodgeman County headlining the district, the Eagles and Royal Lancers game could decide the second-place finisher in the district and which team would get to host a first-round playoff game. Spearville has beaten Ness City in each of the last four seasons. The past three meetings have ended by at least 45 points, with the Lancers winning 50-38 in 2014. Ness City’s only loss this season came 30-14 to now No. 1 Central Plains in the season opener. Meanwhile, Spearville lost 24-8 at South Central in Week 2. Burlingame at Maranatha Academy – This one could be a shoot out among two of the top three teams in 8M-I, District 3. Burlingame is unbeaten, but has yet to play the best of what District 3 has to offer. After today’s trip to Shawnee, the Bearcats will host Madison and travel to Lebo in the coming weeks. Maranatha is still chasing a 32-22 loss to Madison a couple of week ago. The Eagles rebounded in a big was last week with a 62-16 win over Chase County. In that game, Eagle quarterback Nate Burdette completed 15 of 21 passes for 391 yards and eight touchdowns. He connected with Brock West 12 times for 382 yards and all eight scores. Burdette also rushed for a ninth touchdown in the game. Caldwell at South Central – One of the biggest games in eight-man this week pits Caldwell traveling to take on South Central. Both teams are unbeaten in 8M-I, District 2, and this game could ultimately decide the top two playoff spots in a loaded district. After this week, South Central has games remaining against winless Oxford and Argonia-Attica (3-2), while Caldwell still has Udall (4-1) and Medicine Lodge (3-2). Both the Blue Jays and T-Wolves remain just outside the top five in Eight-Man, Division I. South Barber at Otis-Bison – This non-district game would highlight the 8-Man, Division II schedule if it wasn’t for Hanover taking on Axtell. South Barber is unbeaten and ranked No. 3 in the state, while Otis-Bison’s (4-1) lone loss came to Victoria in Week 1. The Cougars are ranked No. 4 in this week’s poll. Both the Chieftains and Cougars are well in control of their district with each winning their first four district games. But since both districts contain an odd number of seven teams, each school has a week away from district play they must try and fill. Thankfully, South Barber and Otis-Bison’s open week in district play coincided and the schools scheduled this game that could prove to be a playoff preview. Beloit St. John’s-Tipton at Frankfort – St. John’s Tipton will take on unbeaten Frankfort in another non-district game featuring teams from seven-member districts. Frankfort has already clinched a playoff spot thanks to a 4-0 start in District 3; however, the Wildcats remaining games are against No. 5 Axtell and No. 1 Hanover. Friday’s contest with the BSJT would provide a tune up for the Wildcats. The Blujays are in a similar situation having started district play 4-0 with a showdown with Mankato-Rock Hills remaining on their schedule. Sharon Springs-Wallace Co. at Dighton – The Wildcats and Hornets meet tonight in a game that should settle the top two teams in District 6. Wallace County has won two straight since an 0-3 start that included losses to St. Francis (5-0), Leoti-Wichita County (4-1), and Oberlin-Decatur Community (3-2). Since then, the Wildcats have shut out district opponents Wheatland-Grinnell and Quinter by a combined score of 98-0. Meanwhile, Dighton is perhaps the most underrated team in eight-man football. The Hornets opened the season 1-2 with close losses to Hodgeman County and St. Francis. Both of those opponents are undefeated and ranked in the top five in 8-Man, Division I. With an extremely small roster, Dighton’s challenge has been to stay healthy, and thus far the talent of seniors Blair and Dalton Hoffman has carried them through.